Sonic Junction is delighted to welcome Acoustic Guitar Master Chris Eldridge to our teaching team. 3-time winner at the International Bluegrass Music Awards and 3-time Grammy nominee, Chris is a master of bluegrass flatpicking whose work has earned wide critical acclaim. Hailed as “one of the most important young guitarists performing today,” Chris has an “elegantly intelligent” sensibility which brings a vitality to the bluegrass and roots music tradition. Chris' skill affords him a fluency and inventiveness he uses to full effect with classic bluegrass and escapades into other genres. 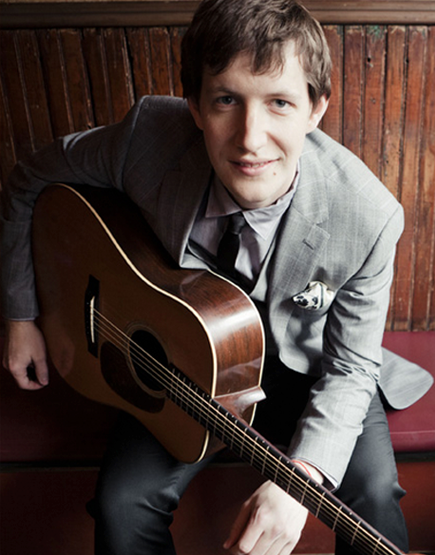 The breadth of Chris’ creativity can be seen in his success as a founding member of the The Punch Brothers, and in Chris’ work alongside musical luminaries including Paul Simon, Renee Fleming, T-Bone Burnett, John Paul Jones, Marcus Mumford, Elvis Costello, Jerry Douglas, Del McCoury among others. More recently, as a celebrated duo with renowned jazz guitarist Julian Lage, Chris continues to deliver thoughtful and inspired stylings which put him at the forefront of acoustic music. Chris grew up in the rich heritage of bluegrass of his father, noted banjoist Ben Eldridge of the Seldom Scene, and under the guidance of incomparable Tony Rice. We are thrilled Chris is passing along his expertise by teaching vocal and acoustic guitar lessons here at Sonic Junction. Chris's lessons start Friday, September 4th. Chris Eldridge with Julian Lage, "Mean Mother Blues"
Chris Eldridge with the Punch Brothers, "Through the Bottom of the Glass"
Chris Eldridge with Dominick Leslie, "Church Street Blues"